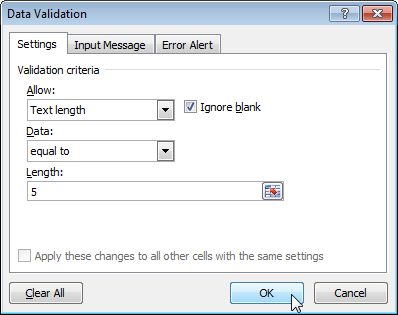 Select range B2:B7 and choose Data Validation. Set Allow to Text length, Data to equal to and Length to 5. Now you can try write something to column Emloyee No. If you have selected at the beginning only cell B2, you can copy Data Validation to the other cells in the column. 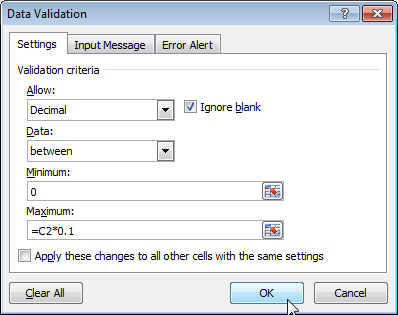 Select range C2:C7 and choose Data Validation. Set Allow to Whole number, Data to between, Minimum to 600 and Maximum to 2000. You can also set Allow to Decimal. It depends on whether you want to allow decimal numbers. 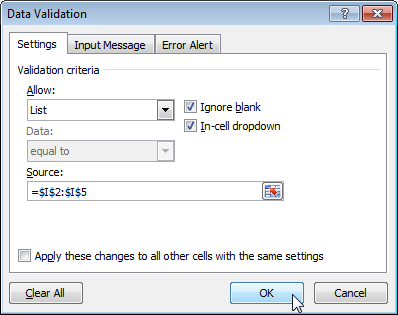 Select cell D2 and choose Data Validation. Set Allow to Decimal, Data to between, Minimum to 0 and Maximum to =C2*0.1. Now copy from D2 to the other cells in the column. You can use Ctrl+c and Ctrl+v or some other way that you know. In this example, we will use the Excel function TODAY(). 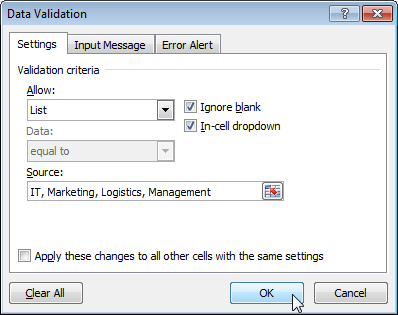 Select range E2:E7 and choose Data Validation. Set Allow to Date, Data to equal to and Date to =TODAY(). 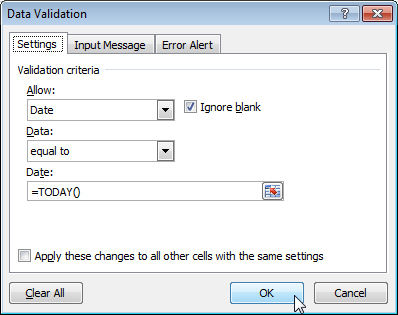 Select range F2:F7 and choose Data Validation. Set Allow to List and Source to =$I$2:$I$5. Or you can type items from the list directly to the Source. Between the values must be , or ; That depends on your version of Excel. This create in the cells a drop down menu. More about drop down menus in the Excel http://excel-example.com/other-tutorial/how-to-create-drop-down-menu-in-excel-worksheet. Note: Change in the source does not change already entered values in the cells. « How many times are the values in the table? how can I check date interval in cell value?